Rocketplane Global: Rockets for satellite launch services and rockets for passenger and tourist rides to Space. 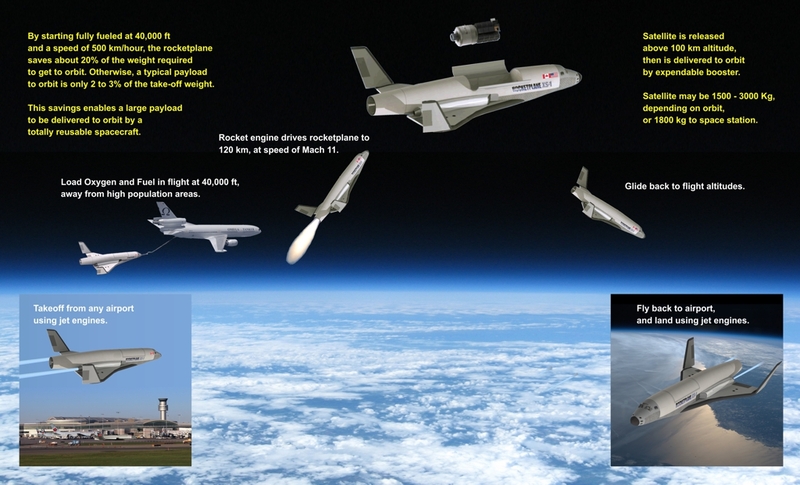 Rocketplane XS: Satellite delivery with a reusable rocketplane. Takeoff from any commercial airport, use jet engines to fly to 40,000 ft. Load jet fuel and Oxygen from a tanker airplane. Then start the rocket engine and fly to 120 km altitude, Mach 11. Release a satellite with a booster to take it to orbit, coast back to atmosphere, restart the jet engines, and fly home. Simple operations, no launch pad, standard airplane operations.